Despite the popular belief that we at Caledon Virtual sit behind our computers for hours on end, barely moving except for typing and mouse movement, we enjoy getting out of the house, letting our hair down and seeing other people face to face. We’re looking forward to a massive amount of fun this weekend. The last installment of the Harry Potter franchise hits theaters today (or at midnight last night if you’re young enough to stay up that late). 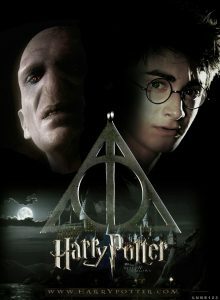 The epic tale of The Boy Who Lived culminates with the Deathly Hallows: Part 2. The Potter series is one of our all time favorite book series, and the movie series has been everything we’d hoped and expected it to be. So, the first part of our Follow Friday is for Mr. Potter. Follow all the Potter news you can handle with SnitchSeeker on Twitter and Facebook. After we catch our snitch, we’ll be heading to the Social Media Summer Picnic on Saturday. Join us, our sister company KimberMedia and the Social Media Club from 4:30 to 6:30 tomorrow afternoon at the Nickel Shelter at Cosmo Park. Our friends at Addison’s are being kind enough to cater the meal; we just ask that you bring a side dish and a donation for Sol House. That’s a pretty busy weekend, everyone. Hope you find time to shut off your computers this weekend and connect with folks at the Social Media Summer Picnic, and at the movie theater. Just remember…if you show up to the movie dressed as Lord Voldemort, you’ll creep lots of people out.